First up, DSO Gaming is reporting that Nvidia announced the details, benchmarks and pricing for the Maxwell-based GTX 9xx cards. 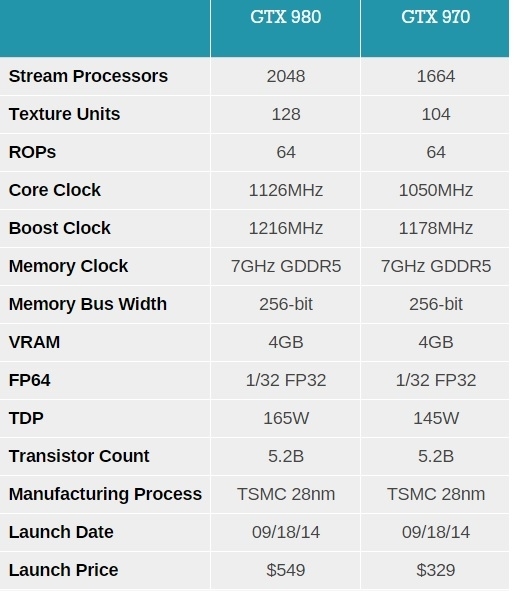 The both Maxwell GPUs contain 4GB of GDDR5 VRAM with the memory clock speed running at 7ghz on a 256-bit bus. You can see how both of them compare and at their price points below. Check it out. Additionally, both cards are built for the latest DirectX 12 technology and the shader technology has been optimized for full voxel-based global illumination – a lighting technique that enables engines to directly influence the light through indoor and outdoor environments from a single light-source, hence the name “global illumination”. We'll be seeing this rendering technique come into play quite a bit on PC titles with engines such as the Unity 5 and potentially the Unreal Engine 4 over the next couple of years. Both GTX 9xx cards will also support multi-frame anti-aliasing and dynamic super resolution for those of you who like playing your games in the glorious 4K resolution. These beastly cards will be made available in the very high-end Maingear gaming desktops, instantly putting anyone who purchases such a desktop in the lord-tier status of PC gaming. "MAINGEAR is always on the bleeding edge of high performance hardware and the NVIDIA GTX 980 continues that tradition," ... "To use a high performance car analogy, with the raw power of a monster V8 and the efficiency of a hybrid, NVIDIA's 980s series is the perfect blend of performance and power efficiency." Funny how that car analogy works... ever since Nvidia started using the GeForce GTX brand it always sounded like they were referring to the GPUs as muscle cars. Anyway, the new 970 and 980 come with G-Sync technology for tear-free frame rendering, along with GameStream technology so you can stream your games from your desktop to the Nvidia Shield. It's still hard for me to see the appeal of the Shield if you already have a rocking desktop; it just kind of seems redundant, and a bit cumbersome for as far as mobility goes. Anyway, the GTX 970 and GTX 980 will be made available in select Maingear desktop brands, including the SHIFT, F131, Vybe, Rush and Force. 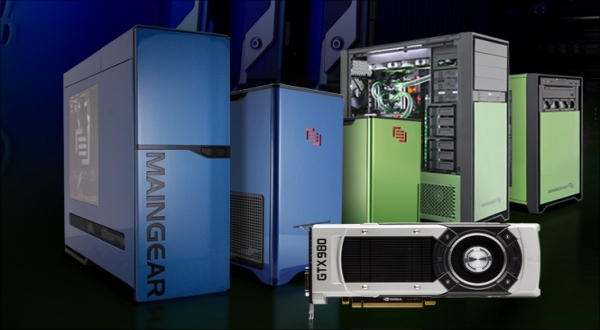 You can learn more about the desktops and the GPUs by paying a visit to the official Maingear website. 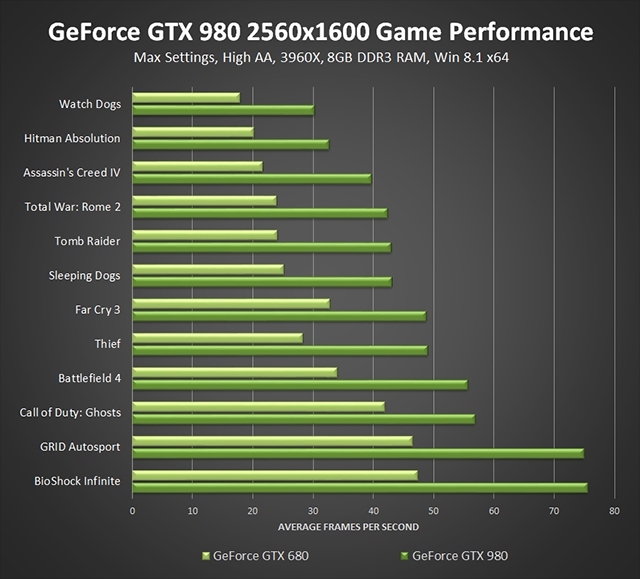 Additionally, you can check out the benchmark results for the GTX 980 below, and witness how terribly unoptimized Watch Dogs is compared to other games on the list.